All around bad guy Drek (Paul Giamatti) is responsible for putting the universe in crisis. He joyfully destroys uninhabited planets across the galaxy. As a result, the Galactic Rangers have been asked to increase their numbers from 4 to 5. 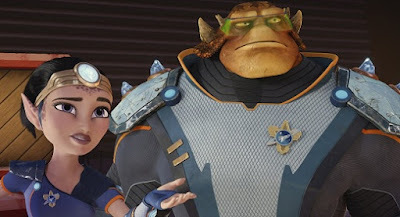 Ratchet (James Arnold Taylor) dreams of being their new recruit. He has to secure an hour of time off from his boss Grimroth aka Grim (John Goodman). Grim gives him the time off but offers less than inspiring words suggesting that Ratchet should dream smaller because it leads to less disappointment. 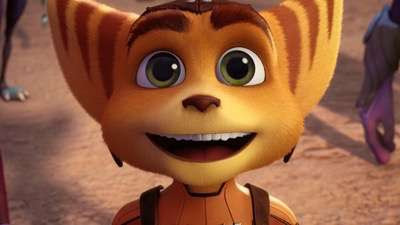 Ratchet is an orphan and as far as he knows the only one of his kind, but he certainly dreams big. The Galactic Rangers are looking for a recruit with heart. The fact that Ratchet’s heart is encased in such a “weak muscle mass of inexperience” is a problem. He also has a history of citations including willful disruption of the space time continuum. Ratchet heads back to work feeling defeated by his audition. Inside a nearby crashed spaceship he discovers a robot. The robot is on a mission of galactic importance. 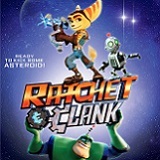 Ratchet names the robot Clank (David Kaye) and soon learns that Chairman Drek’s army will assassinate the Rangers. 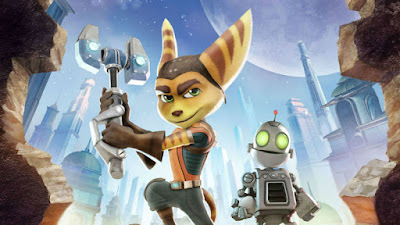 Ratchet crashed on the planet when he was a baby, and feels a kinship with Clank. Soon the two are an inseparable team and after a public victory they are invited to join the Rangers. The training program which usually takes a year can last only 3 days given the current peril. They must discover the madman’s plan and stop him before it is too late. If you’ve never played a Ratchet & Clank video game, you certainly won’t feel lost in the movie. It stands alone well and holds up as its own entity. However if you have played the game you will appreciate the many touches that make it feel true to its origins. The story and the animation will appeal to the elementary school crowd for sure, without alienating older children and parents. There are good messages about standing up to evil and they explore the theme that a loner can become a hero. It’s a simple but well executed story. 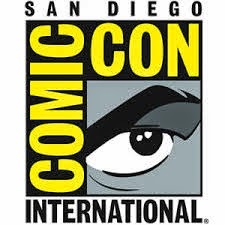 Other voice talents include Rosario Dawson, Bella Thorne and Sylvester Stallone. 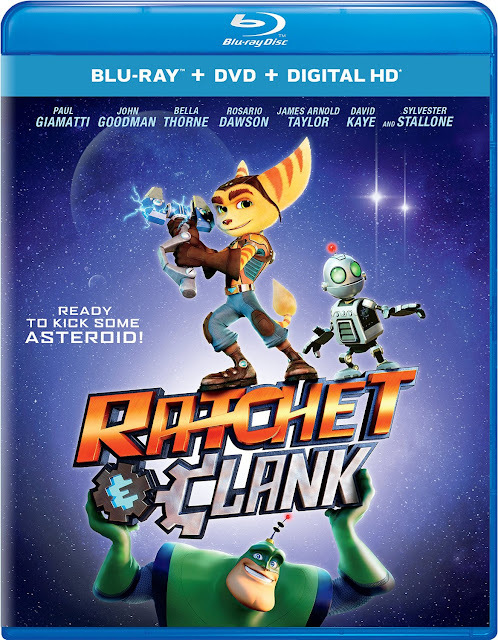 Ratchet & Clank is presented on Blu-ray in high definition with a widescreen 2.40:1 ratio. The film is rich with bold colors. 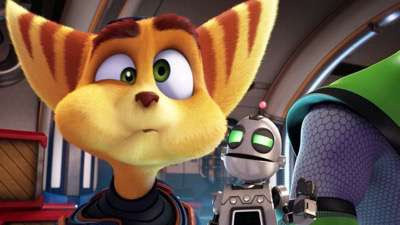 Ratchet’s multi-colored fur is as bright and vibrant as the wide range of colors found throughout the film. With aliens, creatures and robots there is much color to explore. Fine detail is evident on wear and tear on the robots, as well as dirty windshields. This type of animation transfers well to Blu-ray. The DTS-HD Master Audio 5.1 English soundtrack is sufficient throughout the film. Dialogue is consistent and intelligible and sound effects are not overpowering. The Blu-ray also contains DTS Digital Surround 5.1 Spanish and French (Canadian). Directionality is a bit lacking but does not take away from the overall experience. Ratchet & Clank: A Hero’s Journey – Cast and crew explore the characters and what it means to be a hero. Role models, aspirations and themes that touch them personally are discussed by Director Kevin Munroe and voice actors James Arnold Taylor and Bella Thorne. Ratchet & Clank: Leveling Up – A featurette including game footage. The Director talks about the buddy comedy based on 17 titles and the challenges which simply included narrowing down all the ideas. Bella Thorne and James Arnold Taylor provide interviews in this bonus feature that complements the first. 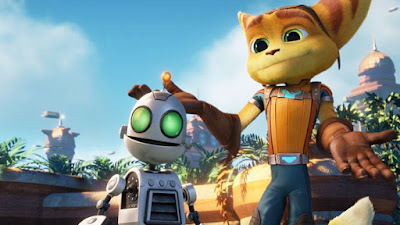 Ratchet & Clank is a fun, cute and energetic film. At 1 hour 33 minutes it’s the perfect length for a family film. It is sure to please younger audiences but I didn’t mind watching as a parent (and we’ve already seen it more than once). The film has good messages about teamwork and friends without being too preachy. It will appeal to kids whether or not they were fans of the video games. The film would make a great back to school gift for a young audience but is recommended for all. You may have noticed that the film flew in and out of the theaters, but don’t let that scare you. In my opinion, it just had too much big competition.